The current revolution 4.0 is also the integration of a new CAM ESPRIT software, for the management of complex CNC programming processes, it also allows the processing of increasingly complex parts, together with the implementation of ORION MES, an automatic production data detection system. This program detects data related to the production carried out, manages the machine states (stationary, equipping, production..) and possible alarms. All this is visible on "touch" industrial PCs located inside the workshop. The continuos investments in research and new technologies allowed Dipiemme to be always updated with mechanical machining branch. Since 40 years Dipiemme realizes brass precision machining, starting from customer specification. That make Dipiemme a warranty for your supplies. The production is oriented to technical machining starting from customer drawing or sample. Dipiemme works in different industrial branch , starting from brass bar of different shapes, doing turning and milling process. We realize metal fittings for several industrial sectors, taking care of every stage in the production of turned brass fittings. 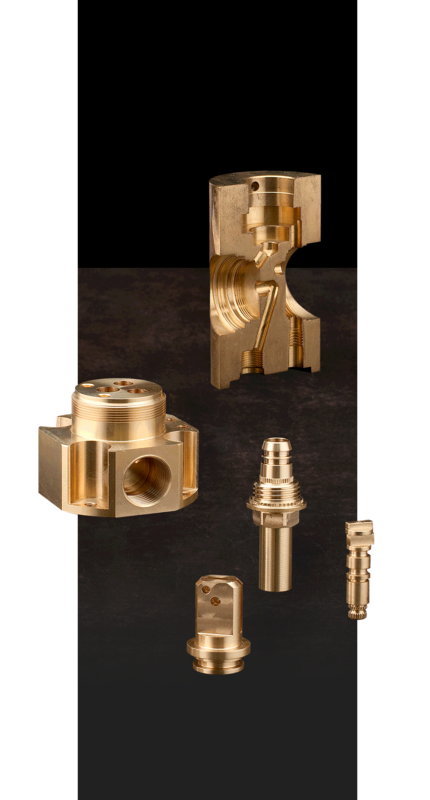 Leader company in mechanical machining, Dipiemme realizes brass precision machining based on customer specification. A guarantee for your supplies.